Asparagus was once the food of the wealthy – if you didn’t have your own garden, you couldn’t grow it. Nowadays it is much more widely available, but shoots cut straight from the garden and cooked immediately still taste best. Asparagus is not only good to eat, but the decorative foliage has a wonderful filmy quality about it. A great uncle of mine grew asparagus all his long life, not to eat it, but so that he could use the cut foliage with his sweet peas. In a potager or decorative kitchen garden, the great plumes of finely cut foliage make a fine display. The tender shoot of asparagus is the part of the plant that is eaten. The shoot emerges from below ground in late spring and early summer. Once it gets above approximately 15-20cm long it becomes tough-skinned and rather chewy and is then best left, the remaining shoots developing into tall foliage stems with inconspicuous Mowers and, eventually, orange-red berries. Asparagus grows wild throughout Europe and has been eaten and possibly cultivated from at least the time of the Ancient Greeks. It has long been grown in gardens, but the main disadvantage is that it takes up quite a lot of space. If you have a small garden but want to grow asparagus, try planting one or two crowns in the flower borders, picking the spikes in early summer and then leaving them in the border as a decorative foliage plant. One of the attractive features of creating an asparagus bed is that it lasts for at least 20 years, and apart from a little maintenance, not much effort is required to produce a wonderful feast each year. Asparagus plants are either male or female. Male plants have the advantage of being more productive and not producing seed (which readily self-sows). Asparagus can be raised from seed, but the results can be disappointing if you use your own collected seed; it is better to buy named varieties on which you can rely. An increasing number of FI hybrids is available, and these produce very good all-male plants. 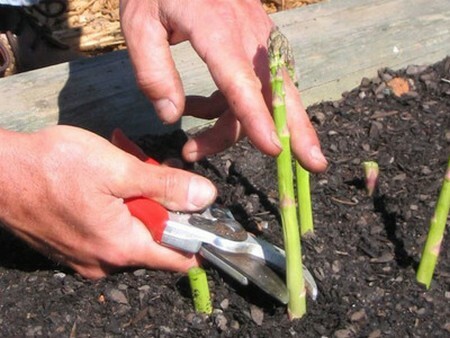 Asparagus needs an open, sunny site, and it likes a light, preferably sandy soil, although it can be grown in any soil as long as it is tree-draining and reasonably fertile. In heavy soils it can be grown by raising the level of the soil or by making a raised bed. In the autumn before planting, dig the bed, removing all traces of perennial weeds and incorporating plenty of well-rotted manure or compost. In the spring dig out a trench 20cm deep with an 8cm ridge running down the centre. It more than one row is required, set the trenches 90cm apart. Set each asparagus crown on the ridge, spreading out its roots around it. Each crown should be 45cm apart. Cover them with soil to a depth of 8-l0cm. If you are growing from seed, soak them overnight in water and sow in a drill 1cm deep. Do this in spring. Thin to 15cm and transplant the following spring in the same manner as for bought crowns above. As the plants grow, draw in more earth from the side of the trench until it is filled. Do not cut any spears in the first year and only one or two from each plant during the next year. Each spring, cover the trench with a layer of manure or compost, leaving it slightly heaped up so that over the years the row becomes earthed (hilled) up in the same way you treat potatoes. Keep the ground weeded. Cut down the ferns as they begin to turn yellow and, if possible, before the berries begin to ripen; alternatively, pick all the berries. If they are left on the plants the birds will eat them and before long asparagus will be appearing all over the garden, for the same reason, avoid putting berried stems on the compost heap. In late spring, when the shoots that have emerged are 10-15cm long, cut them by inserting a knife 5cm below the surface of the soil. Only cut through the stem, do not thrash around below the soil level or you may damage spears that have not yet emerged. Make a slanting cut. After the third year cutting can take place over about six weeks. Asparagus is best used fresh from the plant, but it can be stored for a couple of days if it is stood in a jug of cold water in the refrigerator. Asparagus is usually pest and disease free. Slugs, as usual, are likely to be the worst problem, making holes in the spears. Asparagus beetle can also be a nuisance.